The demand for great manicures and polish with a stylish flare has given birth to a surprising change. The hot new trend in nail polish and do it yourself nail art is the magnetic nail polish. It’s new and just released so get yours to wow and shock your friends now. This new polish is a great gift idea for a friend, it’s something new she may not have nor heard of yet and will love. The magnetic nail polish has metal fibers in it. Once you polish your nails with this polish you use a magnet stamp to arrange the metal lifting it to the surface for an amazing new look. This is a fun new twist in nail polish. Get ready to try something different and unique with your nail polish? The time is now to experiment with this hot new manicure and switch up your nail fashion and style. If you’re into adventure then these polishes are for you. This set comes with 6 different colors, all metallic and glossy including a unique magnetic stamp with 6 different designs. 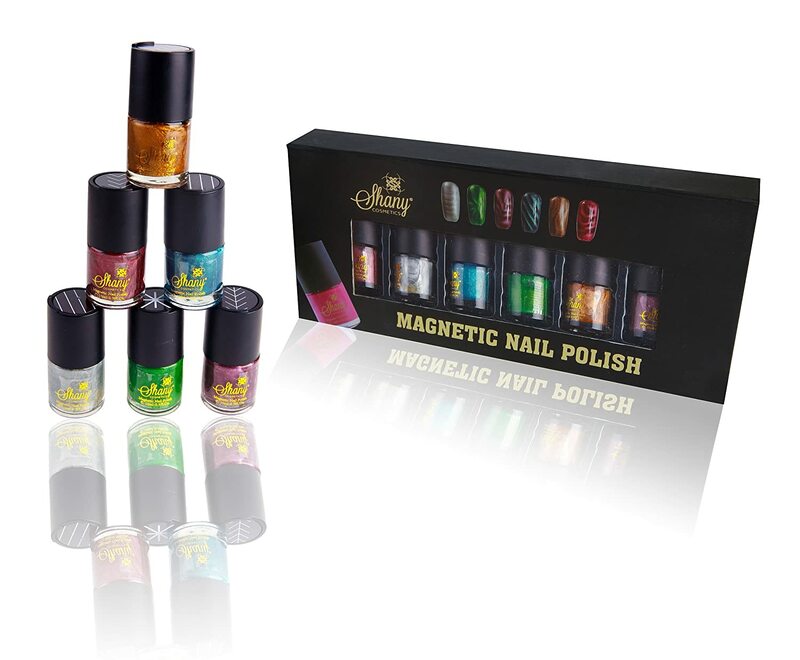 The Shany brand is made with materials imported from Paris, this magnetic manicure set is high quality, long-lasting, and gorgeous. I recently learned about this while watching a review of the best cosmetics for year. I was intrigued and had to get my hands on my own magnetic nail polish. I went to Amazon, my trusted go to source for fabulous cosmetics, and found it. I received the Shany kit, a brand I’m a fan of and put it to the test. There is a great mix of colors including all my favorites and those of most any chic. The polish is easy to apply and the magnetic designs pop working very well. I'm an admitted nail polish addict and have joined the magnetic nail polish club. Shany is a quality product and offers this polish collection at a decent price with the trusted and dependable speedy shipping of Amazon. As always the polish was packaged well taking special care with the fragile product. I love the look and was very impressed as to how long it stays on without chipping. I’m really hard on polish but am thrilled with the metallic polish; the metal fragments must give it strength and staying power. It’s amazing! Check out the six patterns the magnetic polish creates, these designs will have people asking your where you had you nails done. DerdriuMarriner, I like reds, pinks and so something in that range. I use acetone nail polish remover. Amazon once had these amazing pads in a little plastic container they no longer carry, I have looked the planet over to find this product but to no avail. Perhaps there was something bad in it.... So I use a acetone based remover, this is stronger and does the job more easily and without much effort. katiem2, Which color would you get if for whatever reason you only could get one? What do you recommend as remover? Burntchestnut, The magnetic nail polish is really nice, it looks great, wears well and last a long while. " I don't wear nail polish now, but I used glitter nail polish in high school. The metallic polish sounds interesting. I'll tell my friends about it. Thanks for the idea about the polish with the glitter in it. I haven't worn it for a long time, but it does have more staying power. I have a whimsical side! As a male, this isn't really something that applies directly to me. That said I found the article interesting because 1) I now have something to share with the women in my life and 2) I'd never have known about this otherwise.